MUFF WIGGLER :: View topic - Thoughts on Metatronic Mods power supply? Thoughts on Metatronic Mods power supply? Anybody have any experience with that? Recommendations for equivalent or better? I'm looking to power a relatively large system, two 110hp wide cases by 5 rows each. Linear supplies can ripple when you pull too much current causing hum. Just be sure that your current is calculated. I have about that many modules and Modulargrid says 6960 mA on the 12V rail. But having 7 amps would be way too close. I have 15.9 amps available and wouldn't want it to be much less. The 12V rail is almost always the most highly loaded rail (most digital modules today make their 5 volts from the 12 volt rail). Plus the Torroidal transformers used on the Metatronic PSU probably cost at least $100 unless you find some on EBAY or something. You will need at least 3 for that many modules. Most cases that you can buy, ready made will have some sort of switchmode PSU. Hope this helps, or confuses not that much. My main concern is hum. 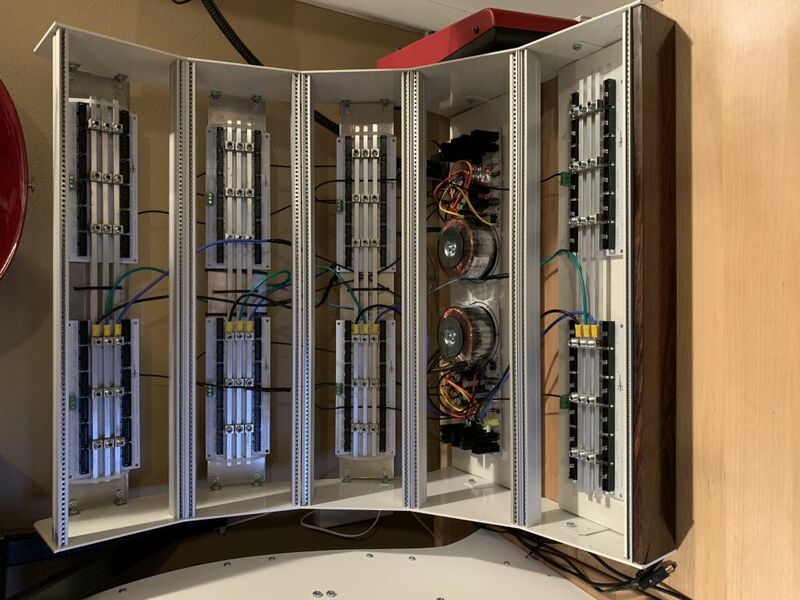 Metatronics has some new distribution boards that use a bunch of copper and theoretically have a much higher barrier to sharing noise across the boards than cheaper versions. My second concern is not having a dozen power bricks laying about. I'd like to have one power cord going to each rack, and one switch for each rack. So a big supply that can drive a bunch of busboards. With regard to linear vs. switchmode, I don't really know anything about that so will have to do some reading to understand the difference. bumping this thread -- surprised I've never heard about them given their claims of having a linear PSU with low noise and a bus bar distro system, and they're even based up the road in Asheville. Anyone have any experience here? Interesting, I hadn't heard of them either before. Might also be possible to swap out the regulators for 15v versions for 5U/FRAC etc use? I ended up using them, and have been happy with the results. I have some of both their older busboards and the new design that has adjustable width (same PSU in both cases). At this point I have 6 PSUs powering 12 bus boards. No hum, all seems well. Their 2 PCB bus boards seem very slick, quite useful. My concern is the size of the linear PSU. (Nature of the beast if you want a good PSU) How do you fit this in a case ? At 3.6" high, at what spot in the case do you put it that you can fit modules above it ? or do you just go for a dead zone ? Or do you actually have a case that can fit this PSU and modules above it ? "Good" power supplies don't have to be large, mains connected, or linear. They are often characteristics of good power supplies but if you focus too much on irrelevant characteristics you end up with companies doing things which wouldn't make the product better, but are there to meet checklists. People wanted heavy products (particularly audio amps) as heavy usually means a larger transformer and better overload capacity, except weight can also be added by oversized heatsinks which are not going to help short term overload capacity. It is important to be specific about what is wanted/needed. If you already have a case then you're limited in choice for power supplies, or will need to install the supply in an enclosure outside the case. The easily adjustable size is convenient for fitting into an existing case. Great prices for the busboards too. Their power supplies are nothing exceptional and priced around the same as other competitive options, so if their size is a barrier there are other choices. 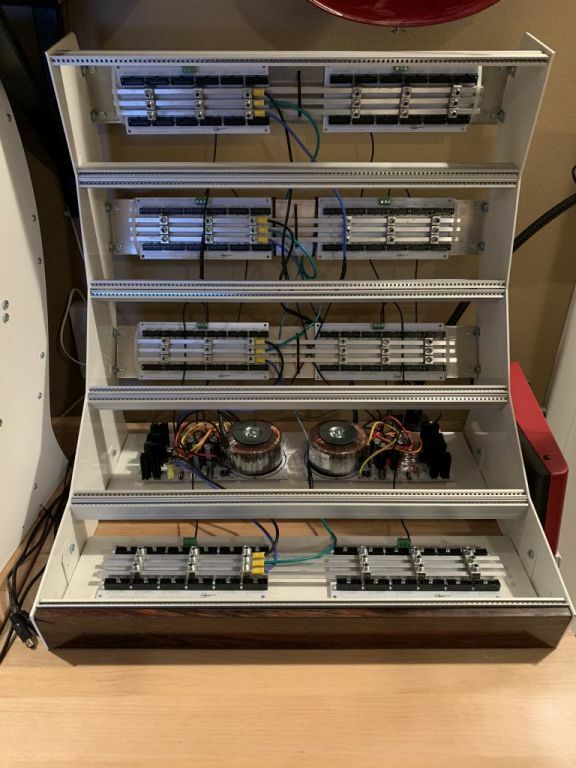 Here's a pic from the most recent case build, using Metatronics' new bus boards. "Good" power supplies don't have to be large, mains connected, or linear. They are often characteristics of good power supplies but if you focus too much on irrelevant characteristics you end up with companies doing things which wouldn't make the product better, but are there to meet checklists. Their power supplies are nothing exceptional and priced around the same as other competitive options, so if their size is a barrier there are other choices. If you could enlighten me on other options I would love to hear about them. I was looking at konstant lab PSU's but I am trying to get something in North America, or even better... Canada. I was set on a linear PSU, but if you can recommend a switching one I would love to hear any and all suggestions. I actually want something very similar to jschussler. Comfortably power 12U or 15U with 2 PSU's. And I don't have a case yet so I could build one spec'ed to fit this PSU or others... I thought the metatronic PSU price was "fair", not amazing but not bad. In the US, Perfect Circuit Audio stock a large range of power supplies including the well regarded L-1, Doepfer PSU3, and Malekko Active Bus Boards. Personally I wouldn't recommend mains power supplies to anyone who has to ask about them, the knowledge required to safely install them goes hand in hand with the skills to select an appropriate choice. Again limiting choices to only supplies that will run the case from 2 units is possibly misleading, having enough capacity for your planned mixture of modules is the important part as windspirit mentioned right at the start of the thread. A case full of digital modules with LCD screens would have a very different supply and distribution to a case full of retro Doepfer modules. And yeah 2 PSU's was just a super rough guess at what I would need, I would rather err on the side of more power than less power. As far as the rack contents are concerned, I think it would start out with some digital power hungry modules but then end up with a lot of low power logic and utility modules as I truly flesh out my ideas. In a lot of ways I can't fully plan this out, just have to let it unravel organically what modules to get. How hard is it to really install these PSU's though ? In my opinion it doesn't look that hard. I won't go near it when its turned on that is for certain. I don't think it's particularly hard but I think it is really important to have a clear understanding of what you are doing and why, as opposed to just following some steps because without understating basic electrical circuits, having decent mechanical aptitude, and good attention to detail, it's easy to make mistakes that could cause problems. Fair enough and I tend to agree with that train of thought: not following directions without understanding every single bit about why you are doing it. And it's not like I haven't done the same! But I learned a lot by figuring out why something didn't work even though I followed "the steps"!